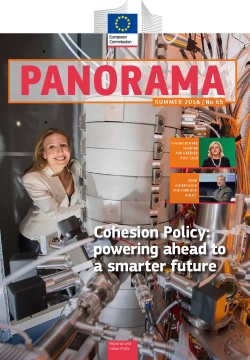 The Summer issue of Panorama magazine, now available to download, looks to the future and considers the European Commission’s proposed budget for the 2021-2027 funding period. As well as an introductory article outlining the proposals and how they hope to reform Cohesion Policy, we have an exclusive interview with Commissioner Creţu outlining the main developments and their reasoning, and we feature initial reactions from a variety of stakeholders across Europe. Our focus this time is on Ireland, which is currently celebrating 45 years of EU membership. In an interview with Minister for Public Expenditure Paschal Donohoe and through a selection of projects we show how ERDF funding has helped Ireland become more innovative and competitive. We reveal the 21 finalists for this year’s Regiostars awards, and preview the themes and details of the next European Week of Regions and Cities, taking place in Brussels in early October. We also explore a variety of cultural heritage projects supported by the ERDF, to celebrate the European Year of cultural Heritage, and our Captured on Camera section highlights innovation in Poland. We report on the recent Good Governance conference and survey the variety of initiatives helping administrative capacity building across the EU, and follow the continuing adventures of our young European social media stars crossing the continent as part of the EU Road Trip project. The projects section visits Italy, France and Bulgaria.